In addition to the effects affecting the color on a "geometric" and "statistic" level, there is a last color correction effect which is more complete and is applied using sliders (as the name implies …). * It also has four tabs: Master, Shadows, MidTones and HighLights which have the same task as those in the Histogram tool: used to choose whether you wish to work on lighter or darker color ranges. * The following four tabs: Gamma, Contrast, Gain, Brightness control how the LUT curves will be modified when a slider is moved. * The seven lines correspond to seven LUT curves (see previous chapter) which may be modified: Temperature, Magenta, Luminosity, Red, Green, Blue and Alpha. 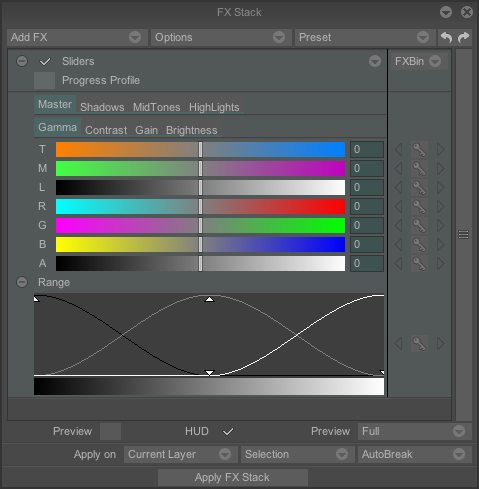 When the Gamma tab is selected, moving the slider to the right increases the height of the L.U.T curve (and therefore increases the values of Temperature, Magenta, Red, Green, ...) for the range selected (Shadows, MidTones, HighLights). The ends of the curve are less affected by the slider modifications (the modifications take place progressively). When the Contrast tab is selected, moving the slider to the right increases the height of the L.U.T curve in its high sections and decreases the curve in its low sections for the chosen range. This means that the strong values of (Temperature, Magenta, Red,…) will be reinforced and the weak values reduced for the range of your choice (moving the slider to the left produces the opposite effect). The Gain tab functions in roughly the same way as the Contrast tab, but the ends of the curve are gradually less affected by the slider modifications (the modifications of the values of Temperature, Magenta, Red,… are the same as with the tab Contrast but work in a more subtle and progressive manner). The effects of the Brightness tab are similar to the Gamma tab but the modifications are not applied in a progressive fashion due to the identical attribution from one end of the curve to the other.